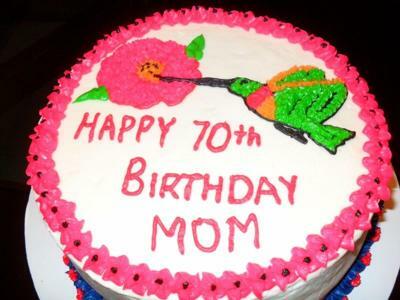 I made this hummingbird cake for my Mom for her birthday, it is a banana pineapple cake. This recipe makes a delicious and moist cake. It is a nine inch round two layer cake with cream cheese filling. I iced the cake with white buttercream icing. The hummingbird and flower I traced with piping gel and transferred it onto the cake, then with a #3 tip and black icing I outlined the hummingbird and filled in the beak and feet, also did the writing on the cake. I colored all of the different colors with Wilton coloring. I used a #16 tip to fill the bird in with the green, red and orange. I outlined the flower with the #3 tip and then filled it in with the #16, then I used the #16 and put some orange with some black dots, with the #3 in the middle of the flower. I used a flower shaped cookie cutter and put four flowers around the sides of the cake and outlined and filled them with four different colors. I used a #352 tip and added some green leaves to each flower. The top trim on the cake was piped with a #106 and I added a black dot with #3 tip in the middle. I used tip #21 to make the bottom trim and the put a different color rosette with tip #16. 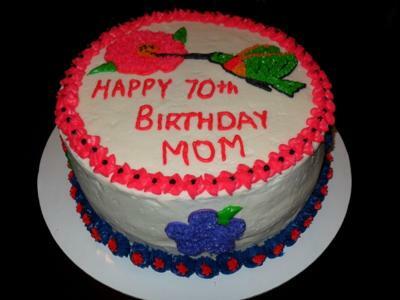 My mom was thrilled with her cake and everyone there enjoyed it. The best part was that I really enjoyed making it.